Play in the snow! Stay in this conveniently located home near the golf course with a hot tub, mountain views, WiFi, and a garage. 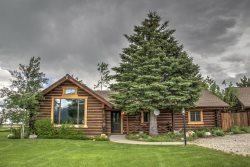 Whether you want to kick back and relax or adventure out in the beautiful wilderness, this comfortable and convenient home is perfect for your Red Lodge vacation. Mountain View Tee & Ski is a great base for skiers and golfers alike. The view from the multiple decks is sure to sooth your soul. Melt away your worries in the hot tub on the lower deck. Summer brings a riot of color in the beautiful landscaping, and the trickle of a small stream running through the property. This home recently just got all new beautiful flooring! Red Lodge is a quick drive or long stroll from this wonderful home. The Mountain View Tee & Ski awaits you on your next trip to the Red Lodge, Mountain area. Very easy to contact and professional in responding. This was our second stay in this property because we are very comfortable there. Great location. Piney and Jenn are awesome. The team was great at keeping in touch with us during the whole process! This property was very beautiful! Its a great home for a large group of people! Super friendly staff, very easy to get ahold of & if you can't get through to them they were very prompt to return my call. Booking was a breeze & we would definitely be back again! "Great place to stay, fantastic location! The house was great! Spacious rooms and the floor plans flowed nicely. The hot tube was a great way to unwind from the day's activities and just enjoy the stars with some music. This house is close to downtown red lodge and if you are really into a great steak, you are only about 20 minutes from a place in Roscoe called Grizzly Bar and Restaurant. Only problem was with the house not having a/c,, there was hardly any cross ventilation from the windows. The upstairs room was very stuffy with no air flow from the winds. Might have been the time of year since we were there in the middle of summer. The wildlife viewing was superb! The overall experience was fantastic! I would definitely stay there again. It would have been nice to know that for this property that the garbage cans need to be left in the garage. It was left outside in the driveway when we arrived. The home owners association will come and scold you as we learned this lesson. Response We are very happy you enjoyed your stay at Mountain View Tee & Ski. Thank you very much for your feedback. We will pass the request for A/C on to the owner of the property and we apologize for the trash being out and the home owners association speaking to you. That was an oversight on our end for having the trash can out of the garage upon your arrival. Please keep AAA Red Lodge Rentals in mind for your future plans. " "Very Beautiful and Accommodating House Had 5 family members use the house for a ski vacation and I don't think I could ask for a nicer place to stay. " "The rental was so comfortable that we all felt immediately at home Lacking the sterile coldness that seems to predominate most vacation rentals, this home had all the stylish decorator touches that made it instantly homey. The kitchen was better equipped than most homes, boasting every convenience needed to cook meals for a large family along with cupboards fully loaded with multiple sets of dishes. Located in an upscale residential neighborhood across from the golf course, it's convenient in winter for skiing on the fairways as well as playing a round in summer. Our only complaint was the surface of all the outside decks became absolutely lethal with ice during the winter because they appeared to have been finished with a very slick type of varnish or shellac. Also, access to the hot tub in winter was very inconvenient, either through the garage or via one of the lethal outdoor decks. " "Family Ski Weekend The house was Fantastic! We loved our stay! Skied hard during the day, and sat around the kitchen table, enjoying the fire in the fireplace. And what could be better tahn soaking in a supurb hottub after a long day on the slopes. The decore in the house is fun and we dare you to count the moose! Can't wait to do it again! " "The house was beautiful, clean and the property was well maintai The location was perfect for all the activities Red Lodge has to offer. The only suggestion would be to update the carpeting in the living room ,stairway and master bedroom. We enjoyed our stay very much and will do it again in the near future. " "Awesome place to stay. Our stay at Mountain View Tee & Ski was fabulous. The house is absolutely beautiful and has everything you need. We enjoyed our visit to Red Lodge so much and will definitely stay there again. The only thing missing was a/C and it was a little warm in July. We just opened a window in the bedroom and that helped a lot. Gorgeous house and area. " "Thoroughly Enjoyable Get-Away!! This property met every expectation- clean, comfortable & nicely decorated. Master suite w/ large en suite top notch. Large hot tub adjacent to rear deck a definite plus! Outdoor spaces & landscaping (especially water feature on property) very well executed. Property is convenient to many recreational opportunities while still close to Red Lodge for shopping and evening entertainment. Mountain View Tee & Ski is ideal for groups up to (6) adults- larger groups may find it a bit small. Property is also located on a fairly high traffic residential street - traffic/road noise were a distraction at times while outdoors. Overall, highly recommended stay- would definitely book again!! " "Mountain View Tee and Ski The tee and ski is a lovely property with a beautiful view of the mountains. " "Greatly enjoyed our stay Left on Jan 8, 2014 for a stay in Jan 2014 We had a very enjoyable time in Red Lodge at the Mountain View Tee & Ski. The house was in very good shape, beds were comfortable and the house was well stocked. We had a great family get away and plan to return next year. " "absolutely outstanding! Left on Oct 7, 2013 for a stay in Sep 2013 1 people found this review helpful property was immaculate, warm and comfortable. Loved the wood-burning fireplace! in town for a family wedding with my 78 y/o mother from DC, who loved the ""rustic elegance"" and attention to detail. Could not have asked for a better experience, will definitely stay again. " "One of the best in the West WE rented this home on our Corvette trip with two other couples it was great! It was very comfortable and well furnished we even extended our stay one extra night because we liked it so well "
"Beartooth Rally A ride to remember We stay at this house every year for the Beartooth rally and we love it! We'll never stay anywhere else. "